Ramblings of an Impatient Artist: It's March 1st! It's March 1st, the month that spring starts (or is supposed to), flowers start to bloom...hmmmm something else is is going on too... Oh yea - it's The Greeting Farm's new release! Dollie with Ice Cream, Dollie with Bow and Up, Up Bean (my fav!) are now all available in the store - woo hoo! So join us in our new release hop! Follow along, check out the other DT gorgeous designs and leave some love. You could be the winner of the entire new release! Jodi Elam - You are here! 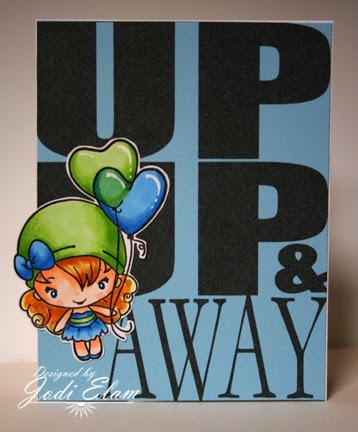 Love the color choices for your stamp. Very cute! I love so much the letters, beautiful card " original"
Lovely card with positive message. Very cute! I just adore this card. Great work! You guys are rockin this release! TFS! oh I love this card!!!!! What a fun way to do the sentiment! Love that idea. She's certainly an Up, Up Bean in this card. She's so cute. How fun with the big sentiment and the cute little bean! She looks like she's about to go up up and away :). She's so cute! Very nice clean and simple cards! Awe this is very Adorable! !! ♡ the new bean. Awesome card!! Love the big sentiment used!! Love it!! This is so cute, love the large font/sentiment, it goes perfectly with this sweet image!! Oo. I love that bold text. And she is so cute floating off the side there. Wow. Like Kristina, I love how you did the balloons. Cute card. Awesome card, love the huge sentiment! Love this card and the HUGE die cut background!!! This is one fantastic idea!! Beautiful card! !